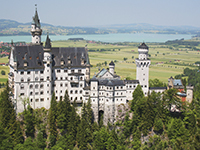 From breathtaking buildings such as the Brandenburg Gate and Neuschwanstein Castle to the tourist delights of Oktoberfest, Germany is one of the most important countries in the world, with its popularity continually strong as a holiday destination. Roughly two million British nationals visit Germany each year, which can be accessed from the United Kingdom either by airplane or a lengthy journey by train or car. A train journey from London to Berlin, Germany’s capital city, can last 13 hours minimum if you are travelling from St Pancras International station. The duration of the same trip by car could take anywhere between 12 and 13 hours. For those who are flying to Germany, an expected journey length of just under two hours can be expected if you are travelling from London. Travellers must account for the time difference in Germany, which is two hours ahead of Greenwich Mean Time. If you are unsure as to how best to adaptyour medication schedule then it is best to discuss a plan with your diabetes specialist. The average climate across Germany is very similar to that of the UK, so travellers with diabetes should have no problems adapting to the weather. Germany’s currency is the Euro, although many restaurants, hotels and shops will accept credit and debit cards, while money can be exchanged within hotels and money exchange services. There are no mandatory vaccinations required to enter Germany, however rabies is present in bats in Germany, so it is advised for those planning activities in remote areas that put them at risk for bat bites to receive a rabies vaccine. If you believe you may require this vaccine then it is advised to consult your doctor eight weeks before travelling which should allow enough time for you to receive it. You should note which syringes are available in Germany, with U-100 and U-40 syringes the most commonly used. Have you got a European Health Insurance Card (EHIC)? Germany is amongst the European countries that allow you to receive state healthcare either at a reduced cost or sometimes for free. It will cover you for medical treatment until you return to the UK. Diabetic medication is available in Germany, but payment is required from a pharmacy, for which the German translation is “Apotheke”. However, possessing an EHIC card allows you to receive treatment at a lesser cost and this money can be recouped when you get back into the UK. Pharmacy opening hours are usually 0900-1830 on weekdays, while the opening times on Saturdays are reduced to 0900-1300. On occasion, some pharmacies may stay open on a Saturday until 1600, while in emergencies, there is always at least one pharmacy opening day and night in every area. The emergency services number to be called in Germany is 112. What language is spoken in Germany? German, although many locals will have a grasp of English, especially those that work in a customer service environment. What sugar free drinks are available in Germany? German, although many locals will have a grasp of English, especially those that work in a customer service environment.